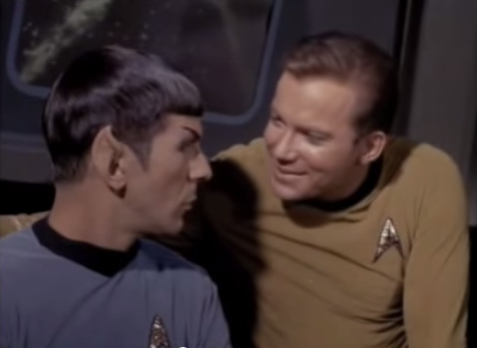 The modern understanding of queerness and fandom, in all its myriad forms and complexities, owes the lion’s share of thanks to James T. Kirk and Spock. They were the genesis of the phrase “slash fiction” (that’s romantic fanfic between same gendered characters, for those of you who are very sheltered), were featured in zines that formed the basis of modern communal fanfiction and fanart sharing, and were some of the only intimately close male characters not to get paired off with paper-thin female love interests out of panic. Though of course, the last one might’ve been because Star Trek creator Gene Roddenberry was fully on board with implying that they were queer. Sorry, should I maybe explain that a little more? People have been dissecting the subtext embedded in Star Trek for decades now, from Henry Jenkins (who was more or less the pioneer in writing about fandom from an academic perspective) all the way to web series like The Ship’s Closet. That is its own brand of important, since reinterpreting media to create space for the unseen has been one of the few recourses of marginalized voices for many years. But those fine individuals are too often dismissed as delusional or ridiculous, “projecting things that aren’t there” (or “recognizing things that I do not personally relate to my life experiences and therefore it isn’t a thing). So instead, let’s focus on the proponents of queerness behind the scenes. As most good discussions of Kirk and Spock must, let’s take a moment to delve a bit into Theodore Sturgeon. Star Trek had an amazing rap sheet of famous sci-fi writers, and this guy was no exception: he wrote some of the most influential works in the genre in addition to coining the eponymous “Sturgeon’s Law”—that 90% of everything is garbage, but the remaining 10% is brilliant. He was also responsible for writing a story called “The World Well Lost,” which was then far and away the most sympathetic portrayal of queer characters in sci-fi (and many a comment has been made about how the two main characters of that story resemble, in broad strokes, our Starfleet officers). As for the actors, things veer from the neutral to the positive. Leonard Nimoy made no mention of the perception of the relationship as romantic in either of his autobiographies nor any interviews I could find (frankly I imagine he had enough on his plate with all the pearl-clutching outcry about Spock’s ears looking “demonic” and so forth). He was an astonishingly progressive man, however, from his beautiful fat-acceptance photography work to playing a gay character right around the time Star Trek was airing (that was 1966’s Deathwatch, and while it might not seem like a big deal now that was the kind of move that could tank an actor’s career). Shatner was a bit more open in making teasing sorts of comments about it, from the ’70s all the way up to more recent stuff. I confess this is no damning evidence, but part of a larger cumulative effect I wanted to create. The most important player of all, at the end of the day, is Gene Roddenberry himself. Which is both the crowning achievement and the waffling difficulty of the whole affair (but more on that in a minute). The first thing to know is that Roddenberry was inspired by Alexander the Great and Hephaestion when he imagined the relationship between Kirk and Spock—he discusses it in an interview that can be found in the William Shatner biography Shatner: Where No Man. What’s notable about that (hold on history buffs, I know you’re way ahead of me) is why those two were on his mind. Roddenberry notes that he’d read the biographies of Alexander the Great written by Mary Renault, which had been published recently. Renault’s biographies, it is also worth noting, were among the first to discuss the sexual/romantic relationship between Alexander and Haphaestion (and also she had to flee the States eventually to be able to write about queer characters without fear of censorship). So that’s our creative starting point. Star Trek as a show was—is—famous for how progressive it was at the time, more often than not hidden under layers of allegory to distract the censors: it commented on race relations (and featured TV’s first interracial kiss despite the censors’ damndest efforts to quash it), the Vietnam War, sexism (albeit with a few…time period hangups of their own), and wrapped all of it up in a thick cloud of optimistic humanism that’s become rarified air in the decades since. But they were always limited in what they would do—Roddenberry himself commented that if he’d actually given the characters 23rd century values, he’d have terrified his audience. I bring up that little comment to discuss a far more famous one, perhaps the most famous in regard to our besotted officers. I’m even going to quote it in full, for a change. This was likewise in Shatner’s biography, in the same interview as the Alexander tidbit. Yes, there’s certainly some of that—certainly with love overtones. Deep love. The only difference being, the Greek ideal—we never suggested in the series—physical love between the two. But it’s the—we certainly had the feeling that the affection was sufficient for that, if that were the particular style of the 23rd century. The last line is his ticket out, and possibly the craftiest bit of sidestepping I’ve ever seen. This is a man who knows he’d recently gone through hell in attempting to show a kiss between Nichelle Nichols and William Shatner. This book was published in 1979, when there was still time a-plenty for unholy hell to come down on his head were he to suggest a physical relationship between Kirk and Spock. So he demurs, as a man who must’ve known damn well that by the time a future that’s abolished capitalism and apparently solved (human) racism comes around they’re probably also okay with the queer community. And if we take that to be true, then we can also acknowledge that he’s given the round-about confirmation of the romance—as direct as we’re likely to get, anyway, given the issues of censorship and societal pressure that even such a staunch progressivist would’ve had difficulty. 1979 is where we’re going to cap things off for the most part, by talking about the last project Roddenberry had major control over. make room for more VFX, clap your hands! I speak, naturally, of the largely reviled Star Trek: The Motion Picture. While we can all agree that that film had a crippling amount of baggage, from its origins as a failed pitch for a new series (hence the often cited “small screen” feel of it) to its pained desire to ape the success of 2001: A Space Odyssey, there is one thing it does very well: it is an almost pitch-perfect resolution of Spock’s anguish over his human heritage. That subplot is engrossing stuff, and Nimoy works through it with great dignity in spite of the limitations of the script and production (it may help that he doesn’t have to wear that ridiculous space suit). Of course, the actual details of why Spock has chosen to purge himself of all emotion are on the vague side in script and novelization, but whatever it was seems to have happened quite suddenly and left an enormous, painful emotional rift between himself and Kirk. 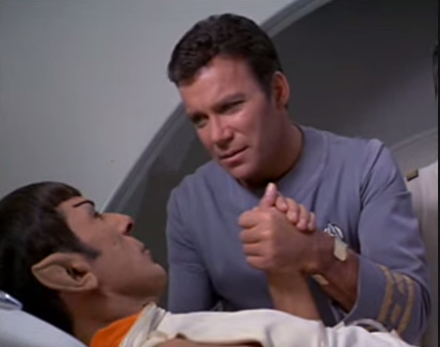 This unspoken “whatever it was” sits heavy at the center of the film and comes to a climax in the famed “This Simple Feeling” scene, after which Kirk and Spock reconcile, are always together, and have no significant outside love interests in the ensuing five films. But let me not be coy. I can lay quite the convincing picture that the unnamed “simple feeling” was in fact romantic love. I’d better, because the script pretty much depends on that fact. A fragmented plot synopsis: the moving mass known as “V’Ger” is coming to Earth because there is something it fails to understand, and in search of that answer it might well destroy anything in its wake. The Enterprise—headed by new captain Decker and a very midlife crisising Kirk—go out to try and stop the incoming threat, where they run into Spock attempting to do the same (hold that thought). V’Ger absorbs one of the Enterprise’s new crewmembers to use as a mouthpiece—Ilia, who was Decker’s lover before she went off to purge herself of all emotions. Meanwhile, Spock risks his life to contact V’Ger’s mind directly, only to find that an existence composed purely of logic is a barren and joyless one. That would be when he declares the importance of that “simple feeling,” clasping Kirk’s hand. Eventually the crew makes their way to V’ger’s core, discover it to actually be the probe Voyager, and stumble upon a solution: Decker offers to be absorbed by the probe so that it can be whole, and so that he can be together with Ilia again. It works because science-magic, and V’ger evolves to a higher state of being because of its new, complete knowledge. That brings us to the snag I mentioned earlier. While the film itself is the great clincher of the subtext going on in the TV series (unresolved feelings, if you like), the novelization is often held up as the equally great disclaimer—it contains a footnote, told from Kirk’s perspective, that seems to say that he and Spock were never involved. I say “seems,” because a professional lawyer took that little chunk of wording to pieces in a truly glorious way, until what is often propped up as the shield against the Space Gay comes out sounding like little more than another one of the good captain’s storied attempts at smiling and dodging giving information about himself. It bears mentioning in the same breath that this is the same novelization that revealed that Spock was unable to complete his Kolinahr because he sensed, from all the way across the galaxy, that Kirk was in distress; and likewise introduced the descriptive term T’hy’la (used by Spock in reference to Kirk), a Vulcan word meaning “friend, brother, lover” (there is a great deal of lingual fun to be had with that word, not least to the idea that a logical people such as Vulcans would be unlikely to have a word with multiple meanings if all were not meant to be applicable in some form, but others have done more complete work on the subject). 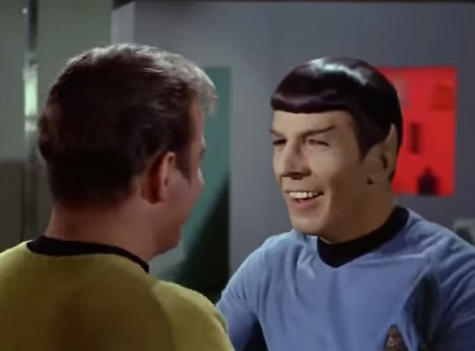 So the denial’s not really a denial, the script supports it thematically and in the performance of the actors, and even as they moved into other films without Roddenberry at the helm Kirk and Spock were each other’s most important bond for the rest of their lives. What a world. What a team. What a win for queer geeks. but I couldn’t resist Kirk’s expression. A final note: while I’m quite the fan of Death of the Author as an interpretive practice, it hasn’t fared queer Star Trek fans so well in the past. Death of the Author meant reams of thoughtful, beautiful interpretive work being swept under the rug in the name of mischaracterizing Kirk as a womanizer among other things (though he was in fact a fine specimen of a feminist). The general cultural osmosis of Star Trek as “the thing with phasers and Vulcans in space” post-Voyager has slowly eroded the franchise’s progressive mission until we’re left with a former helmsman who freely and happily admitted that he hated the original series and created a reboot in the 21st century populated pretty much entirely by cis heterosexual white people and severely reduced roles for the female cast (not to mention squandering a neat AU concept and talented cast on The Worst Script and a general slack-jawed air to the thing); a (thankfully now defunct) successor director who didn’t see the point in bothering to try for inclusivity in Star Trek, and the feeling of a slow death of the heart of a great thing. So I’ll appeal to authority. I’ll keep supporting those hard working folks in fandom, too. Otherwise the greatest triumph of censorship then will be that people look back and think those exclusions were just plain old decisions. Want to share this on Tumblr? There’s a post for that! Vrai is a queer author and pop culture blogger; they boldly left 20 minutes ago, JJ, you should’ve been ready. You can read more essays and find out about their fiction at Fashionable Tinfoil Accessories, support their work via Patreon or PayPal, or remind them of the existence of Tweets.